Although Sinterklaas is always portrayed in the vestments of the bishop he once was, his status as a canonized saint has had little to do with the way the Dutch think of him. Rather, he is a kind of benevolent old man, whose feast day is observed by exchanging gifts and making good-natured fun of each other. 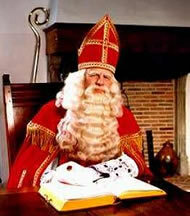 It so happens that the legend of St. Nicholas is based on historical fact. He did actually exist. He lived from 271 A.D. to December 6th, 342 or 343. His 4th century tomb in the town of Myra, near the city of Anatolia in present-day Turkey, has even been dug up by archaeologists. The Dutch are busy too – shopping for, and more importantly, making presents. Tradition demands that all packages be camouflaged in some imaginative way, and that every gift be accompanied by a fitting poem. This is the essence of Sinterklaas: lots of fun on a day when people are not only allowed, but expected, to make fun of each other in a friendly way. Children, parents, teachers, employers and employees, friends and co-workers tease each other and make fun of each others’ habits and mannerisms. Another part of the fun is how presents are hidden or disguised. Recipients often have to go on a treasure hunt all over the house, aided by hints, to look for them. They must be prepared to dig their gifts out of the potato bin, to find them in a jelly pudding, in a glove filled with wet sand, in some crazy dummy or doll. Working hard for your presents and working even harder to think up other peoples’ presents and get them ready is what the fun is all about.